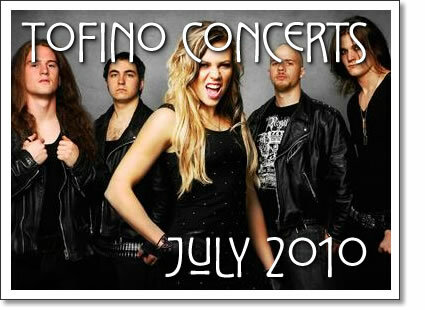 The following concerts in Tofino are happening in the month of July 2010. Tickets for shows at the Tofino Legion are available at Tofitian and Long Beach Surfshop in Tofino. Tickets for events at the Maquinna Pub are available at the door. DJ Murge has been playing the club scene for over 10 years now. His eclectic up tempo sets always keep the booty's shaking . His style of music caters to all tastes across the board. If it's funky it's in his set. He pushes fresh music and new music, and is best known for digging up surprises from the past. Murge has produced tracks for the likes of Slug (Atmosphere), Swollen Members and remixed work for Tegan & Sara. It seems the key to success in this game is diversity, and the ability to wear an infinite number of hats, while still maintaining your core vision for your art. Murges Dj sets are the product of his vision for his music, and through it, he hopes too show the industry, and the clubbing community, that its time to start paying close attention. Celebrate our country's birthday with Nye Sullivan and various other local talents. The Nye Sullivan Band is a four-piece, blues-rock band, based out of Halifax, Nova Scotia. They play all original music and are known to move the crowd at their shows. The band consists of Nye Sullivan who writes the music, sings, plays guitar and harp, Aaron Judge on bass, Luke Meredith on the drums and Scott Turnbull on lead guitar. Originating from Wellington, New Zealand, The Black Seeds have carved out their reputation through platinum selling albums, a masterful 8-piece live show, and a unique sound that fuses infectious grooves and melodies with undiluted roots music. Led by the vocals of Barnaby Weir and Daniel Weetman, at its core The Black Seeds music is a boundary-crossing sound fusion of big-beat funk, dub, soul, and afro-beat, mixed with vintage roots-reggae. Miesha & The Spanks are a ferocious garage-pop twosome! Fronted by Miesha Louie, the gut-spilling songstress, and held down by Justin Landstorfer, the hard-hitting juggernaut, these two make a deadly pairing. They will be joined by Pine Tarts, best categorized as garage rock, but with more sweetness and pop to them. This is their first real tour, but their latest release is in this month's Exclaim! 's top 40. It all began with acoustic guitars, two voices and a Vancouver beach. In 2007, Paul and Lisa Jarvis started writing songs together as a mellow release from their hard rock bands. By the time those bands called it quits, the duo had enough material for the first Mojave album, Stories. The Mojave sound takes Paul and Lisa’s hard rock roots and winds in a quieter intensity. Lisa’s clear vocals soar over delicate acoustic guitars, viola, violin, and eclectic percussion – weaving melodies, telling stories. Hailing out of East Vancouver Bison B.C. have been playing their scorching thrash punk metal since 2006. The group was born from the ashes of seminal Vancouver skate-thrash band S.T.R.E.E.T.S. Their sound is a colossal wall of fuzzed out shredding, they are a headbangers dream. Their message is punk rock angst and revolution. Self-described “Canadian dirtbags” and veterans of Vancouver’s deep thrash and indie scenes, they are hitting their stride and offering up a new soundtrack for our last party before certain extinction. There is illness, abuse, apocalypse, and French horn. This is definitely a band for fans of doom, stoner rock, sludge, and good old fashioned heavy metal. The members of Framed Faces have spent their lives making emotionally charged music. Presented as a waltz of rock and folk strung together with haunting harmony, Framed Faces is the combined experience of four storytellers. Framed Faces will be joined The Sumner Brothers who like many of their heroes before them; Johnny Cash, Townes Van Zandt or Neil Young, their songs aim to pierce hearts and dig deep beneath the skin. If the Brothers don't own a song, if it does not live in the depths of their hearts and come from that place of true raw emotion, it doesn't come at all, if they don't believe it, you won't hear it from them. It is this commitment to authenticity that first drew the brothers to the songs of country, folk and blues, to roots music. Kobra and the Lotus is a female fronted heavy metal band from Calgary, Alberta, Canada. Forming in late 2008, Kobra and the Lotus released their debut Album Out of the Pit in March 2010, in Canada on Sonic Unyon Distribution. The album was a popular release on campus radio charts across Canada and several US internet Metal radio stations. The band's sound is often compared to Lee Aaron and Iron Maiden. Vancouver Island based band Current Swell has a unique style of music that is deeply rooted in folk and blues, reggae inspired, and rock driven. The musical recipe is equal parts prairie and coastal, blending a couple of acoustic guitars, a lap slide, harmonica, drums, bass, and 4 vocal mics. This formula amounts to a tightly polished act and is pushing the boundary of what people know as new music. Tofino concert listings from Tofino Time Magazine. Shows at the Tofino Legion and other music events in Tofino in July 2010.